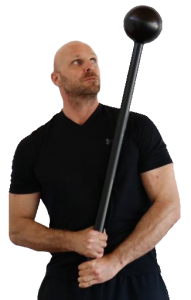 Hi, my name is Dan Clay and I’m the owner of Steel Mace Australia and Education Director at The Dangerously Fit Academy (DFA). I’ve been a personal trainer in Sydney since 2003 and still run my own fitness company. Having personally trained hundreds of fitness professionals to work at Dangerously Fit, I noticed a real shortage of trainers entering the fitness industry that was qualified to use many of the training tools that are now commonplace. Most fitness education providers are stuck in the past and fail to educate their students on the latest cutting-edge training methods. The reason I founded The DF Academy and developed a selection of cutting-edge training programs was to give trainers the tools and skills they need to be successful in this highly competitive industry. But, if you’re a personal trainer, Crossfit coach, functional studio owner or boot camp instructor… these ‘unconventional’ training methods are what’s going to set you apart from your competition and give you the edge you need. All DFA qualifications are accredited through Fitness Australia and recognised around the World by the International Confederation of Registers of Exercise Professionals (ICREPS). Thank you for taking the time to read this page and please feel free to contact me if you have any questions about our courses.